No matter how long you spend testing something a few bugs always seem to find a way to get out into the wild, sadly iKana 2 is no exception. Embarrassingly the two problems primarily affect the registration experience and your ability to download new upgrades through the application itself. 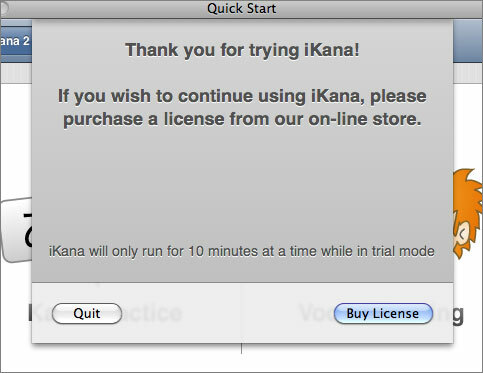 So if you were puzzled at seeing an empty grey box appearing after 10 minutes of using iKana, here’s why: iKana’s new trial limitation is limiting you to a 10 minute session before it will ask you purchase or quit. But due to a font presence check going awry that message was not being displayed. Now it’s working properly in 2.0.1, I hope you appreciate the improved license installation process in iKana 2. It should be a lot more trouble free and pleasant to use. This new method will be cropping up in iKanji 1.4 next and will eventually spread to all our Mac apps. The other, more annoying problem is that 2.0 also broke the Sparkle based update mechanism which means you’ll have to manually download and install the 2.0.1 update from our website. Hitting the update button in iKana at the moment will download the update but will land you with a code signing error. Sorry about that! Unfortunately we only tested upgrading from older versions of iKana &ndash which works fine. It’s important to install the 2.0.1 update or you won’t be able to auto-install future updates either. Right on time for the new school year.